I found the basic recipe from the blog “Reflections of a Science Teacher”1, but I wanted to share how I have modified this procedure and other tips/tricks. I also provide students with background from a hot-process soap-making lab at Michigan State University2. 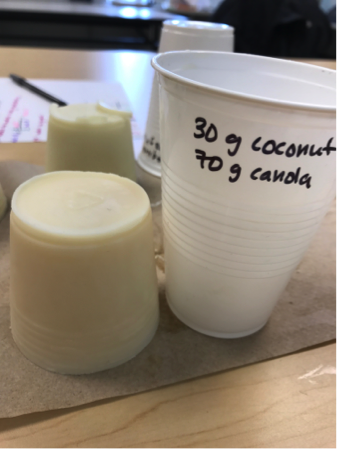 I thought that hot-process soap, while taking less time for the soap to be ready to use, was too complex and had too many safety concerns for me to use in my own classroom. So far, I have tried this activity for three years with two different recipes. In a basic soap recipe, oils reacts with the sodium hydroxide (lye) to produce soap and glycerin. Most cold process soap recipes include “superfatting”, which simply means that the oil (the fat) is in excess to ensure that all of the sodium hydroxide is consumed.3 Both of the soap recipes that follow have 5% superfatting with reduced water (33% instead of 38%) because the recipes mostly use liquid oils, and I used an online calculator4 to check the amount of sodium hydroxide needed. Figure 1 - Pulling soap out of cup/mold. The first recipe uses only olive oil and canola oil; this is the cheapest and easiest method to use. The original blog post referenced, Reflections of a Science Teacher, used only olive oil; I chose to cut it with canola oil to reduce cost. A pure canola oil soap is also possible, but should be tested and the amount of lye required would need to be recalculated (there are plenty of lye calculators available online, such as SOAPCALC). The first recipe does not require the use of a hot plate to melt the oils. This soap takes a little longer to harden and should not be unmolded for at least two days. Figure 2 - Soap using coconut and olive oil. Figure 3 - Soap using coconut and canola oil. 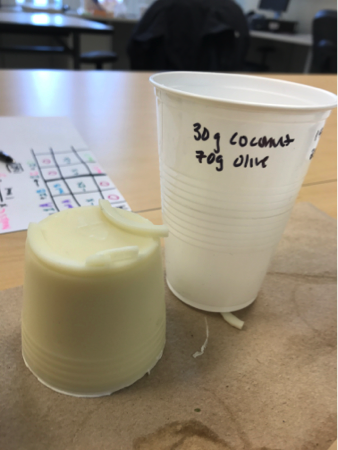 The second year I tried that we made soap in my course, I tried using olive oil, canola oil, and coconut oil. However, I found that the soaps were extremely soft. I wasn’t expecting this, as coconut oil usually produces harder soaps (as it is a solid at room temperature). I have not been able to find an explanation for this but I suspect that more glycerin is being formed, leaving the soap softer. Since then, I modified the second recipe to include only olive oil and coconut oil OR canola oil and coconut oil, and found that this recipe produces a nice hard soap that can be easily unmolded after a day of curing. The canola/coconut soap was also a little wet immediately after unmolding (see figure 1), but after a day or two of curing in air looked fine. A hot plate is required to melt the coconut oil before it is mixed with the liquid oil. In either case, the soap must be emulsified properly before it can be poured into the molds (plastic cups). I have used two methods that both work well – students can either stir and then the teacher can use a stick/immersion blender to complete the emulsification, or students can mix the soap in a mason jar. With a stick blender, it takes about 1-2 minutes to reach trace. (“Trace” refers to the point in soap making that the oils and lye solution have emulsified and begins to thicken.5 In a tightly capped mason jar, 10-15 min of vigorous shaking will also completely emulsify the soap. I have usually done this lab before spring break, so the soaps will cure in the classroom for the week. Students can then unmold their soap when they return and wrap the soap in wax paper or place in a plastic bag to take it home. Technically, they should allow the soap to cure for at least another week before using the soap. This curing process allows excess water to evaporate and results in a harder soap. The pH of the soap will also continue to gradually decrease. The recommended curing time is 4-6 weeks for cold process soap. The longer the soap cures, the easier it will be to use, the longer the bar will last, and the gentler it will be on the skin.3 However, the soap should be safe to use after 2-3 weeks of curing. If you choose to use this lab, I would recommend looking at the resources on Soap Queen3 (this is where I learned how to make soap at home). Note that “trace” for the soaps described here will be much less thick than the recipes on Soap Queen, particularly the version with only liquid oils. It really will look like vanilla cake batter. Also note that the students’ bars will be about half the size shown in the photos, because I just poured the entire batch into one cup when I was testing the recipe this year to see which would be the best to use. This past year, I used the first recipe because of its simplicity, but the olive oil/coconut oil recipe will produce the nicest soap. I have taken home the bars that I have made for samples and any of them are fine soaps to use for hand washing (I wouldn’t recommend them as a facial soap because they may be harsher than what we are used to). The longer the soaps sit before use, the harder they will be and the easier they will be to use. 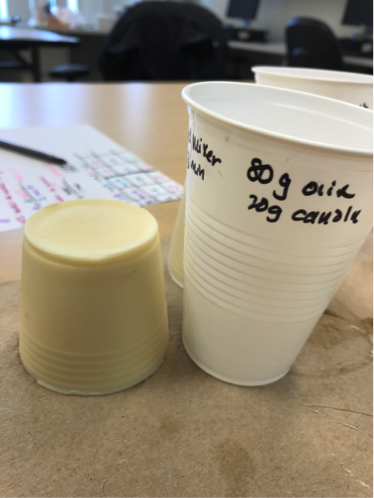 An additional note: I have noticed that some students’ soaps remain very soft and sticky after a week and are almost like Playdoh, regardless of the recipe used. While I am still not sure why this happens, I suspect it has to do with how the oils and lye are mixed together. The softer soaps will harden properly after several weeks and are still safe to use. Safety notes: I pre-weighed the sodium hydroxide so that students did not have to worry about directly handling solid sodium hydroxide. I suggest you set out the pre-measured NaOH in beakers, plastic cups or weigh boats (do not use paper cups since NaOH is highly hydroscopic). I also had students wearing safety aprons, but a strong lecture on the importance of safety before they start was sufficient to make them be careful. Having some vinegar on hand is a good idea as well, to deal with any spills. If students spill raw soap on their skin, they should quickly rinse with plenty of water. Be very careful with the sodium hydroxide. If you spill any NaOH on your skin, rinse with water IMMEDIATELY and call your instructor. Be careful with the glass stir rod. If you are not gentle with it, it will break. 45 minutes to just make the soap. Discussion of key concepts may take another class period. I assign my students to read the background information including the history of soapmaking and the reactions involved that is available in a Michigan State laboratory about soapmaking and biodiesel. Write your name and class period on a plastic cup. Each person will use one cup. This will hold your soap. Measure out 33 g of water into the 150 mL beaker. Carefully add the 12.8 g of NaOH (pre-weighed) to the water and stir gently with the glass stir rod until everything is dissolved. Do not touch the sodium hydroxide. Do not splash the solution. DO NOT keep the beaker near your face or breathe in the fumes from the solution. The beaker will get hot as you stir, so keep the beaker on the table. Leave the glass stir rod in the beaker. Obtain some olive oil in your cup marked “olive oil” from the front table. Measure out 80 g of liquid oil into your 250 mL beaker or Mason jar. Obtain some canola oil in your cup marked “canola oil” from the front table. Measure out 20 g into your weigh cup. Add the canola oil to your beaker with olive oil. SLOWLY trickle the lye (NaOH) into the oil, stirring with the glass stir rod continuously to emulsify. DON’T TOUCH IT! Once all the lye is added, continue to stir carefully but vigorously for about 5 minutes. Bring the beaker to your instructor to use the emulsion blender. Blend the mixture until you reach “trace”, when the oils and lye solution have emulsified and the mixture begins to thicken. Your mixture should be the color and consistency of vanilla cake batter at this point. If using a Mason jar, cap the jar tightly and shake it vigorously for 10-15 minutes. Trade off with your partner. Pour your soap solution into the two labeled plastic cups. Leave the soap in the cups to cure. After a day or two, we will remove the soap from the plastic cup and leave it on waxed paper to aid the curing process. This type of soap needs to mature to lose its alkalinity (pH 10-12 when new). Use only after at least 3 weeks of “curing”, or when the pH level is around 8. Write your name and class period on a plastic cup. Each person should write their name on one cup. This will hold your soap. Obtain some coconut oil in your cup marked “coconut oil” from the front table. Measure out 30 g into your 250 mL beaker or Mason jar. Place the beaker on a hot plate set to 150 C. Let the coconut oil melt completely; you may need to swirl to get everything to melt. Once it is completely melted, set it aside and turn off the hot plate. Carefully add the 14.0 g of NaOH (pre-weighed) to the water and stir gently with the glass stir rod until everything is dissolved. Do not touch the sodium hydroxide. Do not splash the solution. DO NOT keep the beaker near your face or breathe in the fumes from the solution. The beaker will get hot as you stir, so keep the beaker on the table. Leave the glass stir rod in the beaker. Obtain some olive oil or canola oil in your cup marked “liquid oil” from the front table. Measure out 70 g of liquid oil into the weigh cup. Add the olive or canola oil to your beaker with coconut oil. Bring the beaker to your instructor to use the emulsion blender. Blend the mixture until you reach “trace”, when the oils and lye solution have emulsified and the mixture begins to thicken. Your mixture should be the color and consistency of vanilla cake batter at this point. If using a Mason jar, cap the jar tightly and shake it vigorously for 10-15 minutes. Trade off with your partner. I pre-weighed the sodium hydroxide so that students did not have to worry about directly handling solid sodium hydroxide. I suggest you set out the pre-measured NaOH in beakers, plastic cups or weigh boats (do not use paper cups since NaOH is highly hydroscopic). I also had students wearing safety aprons, but a strong lecture on the importance of safety before they start was sufficient to make them be careful. Having some vinegar on hand is a good idea as well, to deal with any spills. If students spill raw soap on their skin, they should quickly rinse with plenty of water.